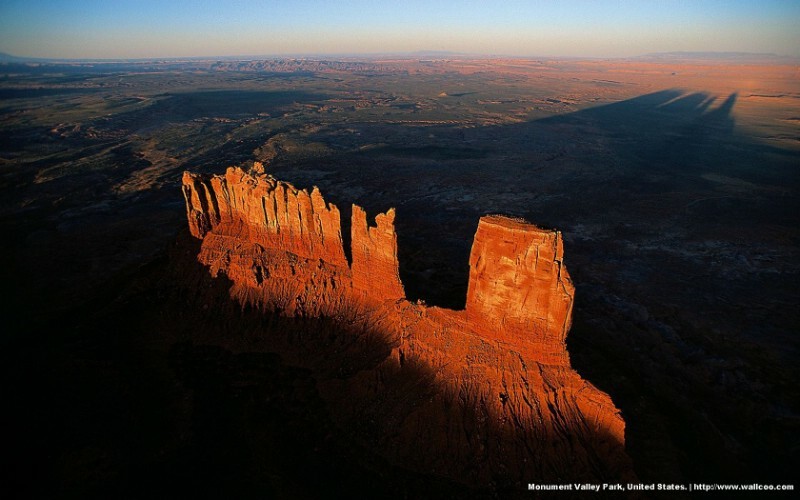 鸟瞰美国：纪念碑山谷公园，Monument Valley Park encompasses almost 12,000 hectares (30,000 acres) of desert along the border of Utah and Arizona. Officially run by the Navajos since 1958, Monument Valley represents the culmination of many histories. First, there is its landscape of buttes, plateaus ( mesas ), and enormous sandstone chimneys, some of which reach 600 meters (2,000 feet) - witnesses to the geological upheavals the region has known, and sculpted by erosion for the past 70 million years. Second is the mid-nineteenth-century conquest of the West, represented by the likes of Kit Carson, who tried unsuccessfully to expel the Navajo Indians and enclose them in a reservation. A third story is that of the rush for gold and silver in the second half of the nineteenth century, after the Indian Hoskamini discovered seams under Navajo Mountain. The ensuing struggle between the Indians and two former members of Kit Carson’s band has left its mark on the park, as two of the finest buttes in Monument Valley bear the names of the two murdered men. Last of all, since the 1940s, Hollywood has adopted its unique decor as the scene of many of its great westerns, a symbol of all its violent past, that of nature and men alike.